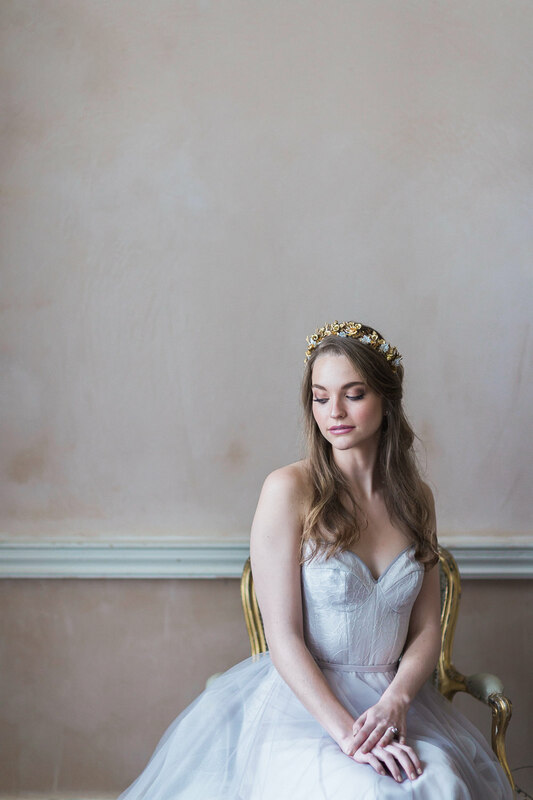 With inspiration from Japanese philosophy, fine art, and ballet, the concept of this shoot was to capture the rituals of bridal preparation during the morning of a wedding – the bride’s ‘first dance’. 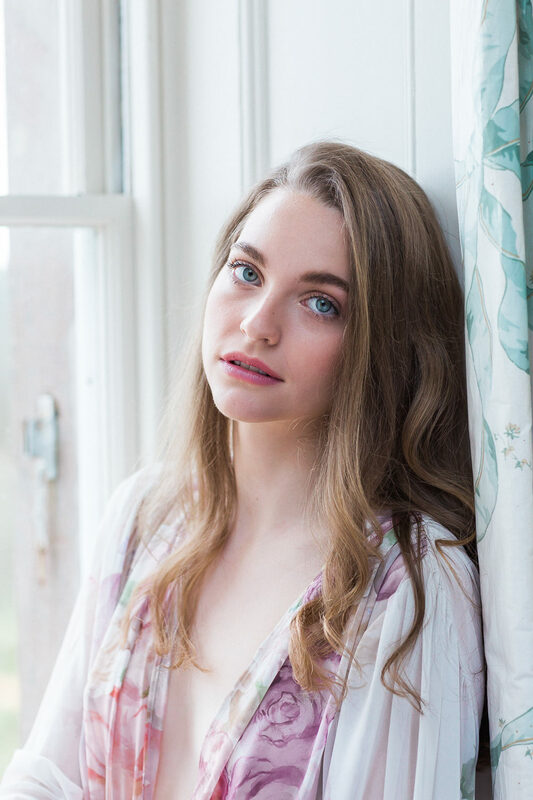 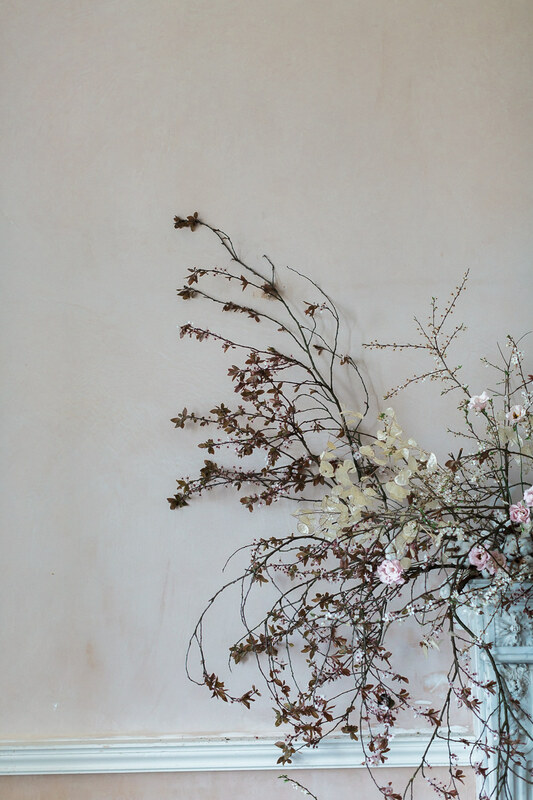 Just over a year ago, photographer Siobhan H Photography and I connected by chance through Instagram, over a shared love of the concept of wabi sabi, the appreciation and discovery of the beauty of imperfection. 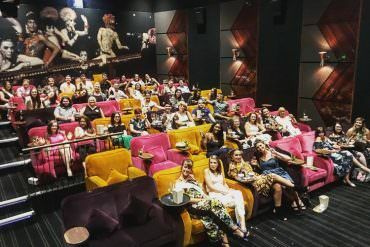 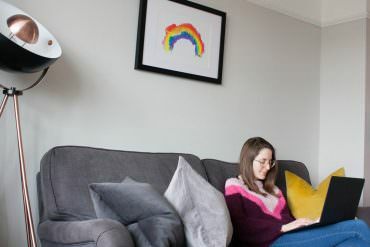 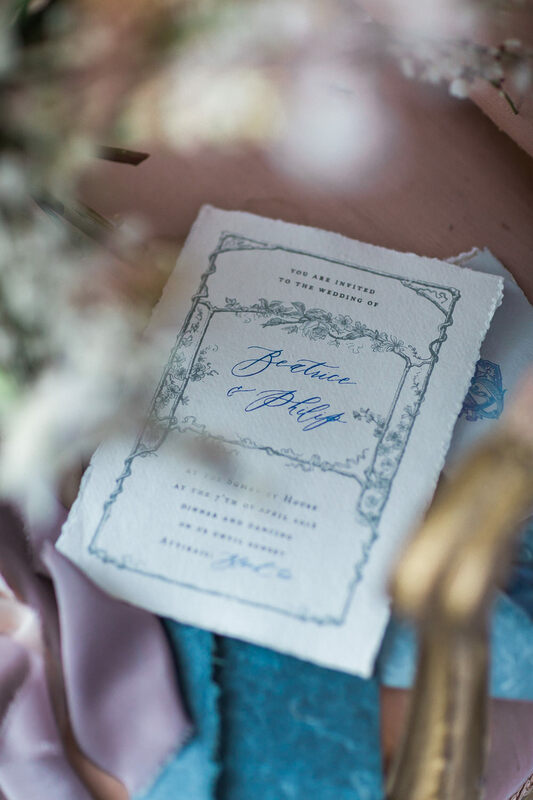 We arranged to meet over coffee in London, and sparks of creativity flew as I described my vision for my new business, The Stars Inside – a styling and wedding planning brand all about playfulness, storytelling, and otherworldy experiences. 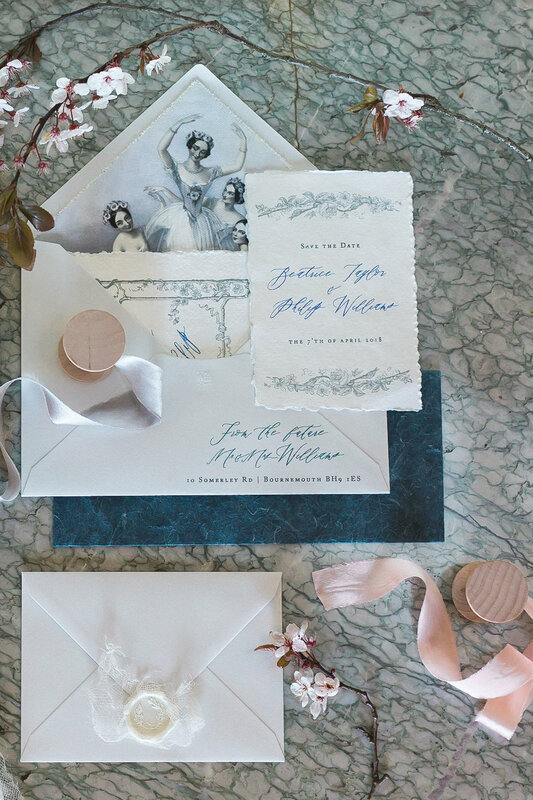 As morning turned to afternoon, our notebooks brimming with scribbles, the seed of this shoot was born, and we’re so excited to share it with you today. 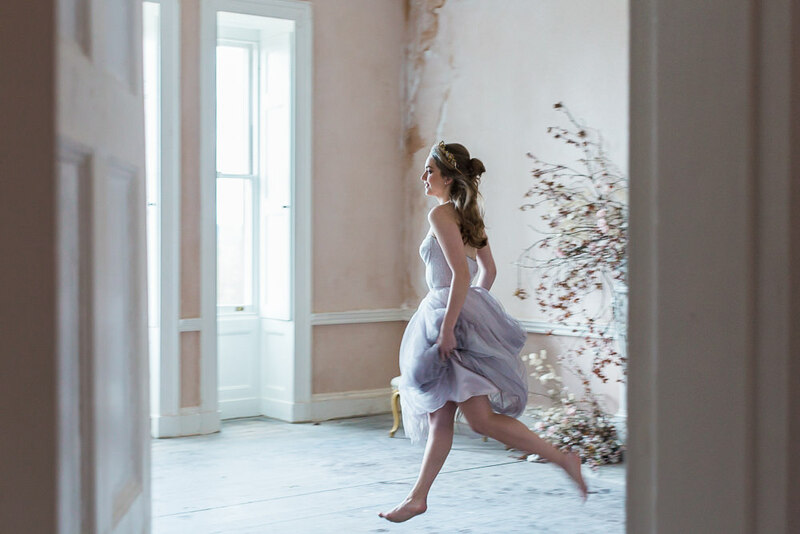 For us, this editorial was an exploration of grace, movement, and authenticity, with much in common with trying to find the words to describe a ballerina’s first flight. 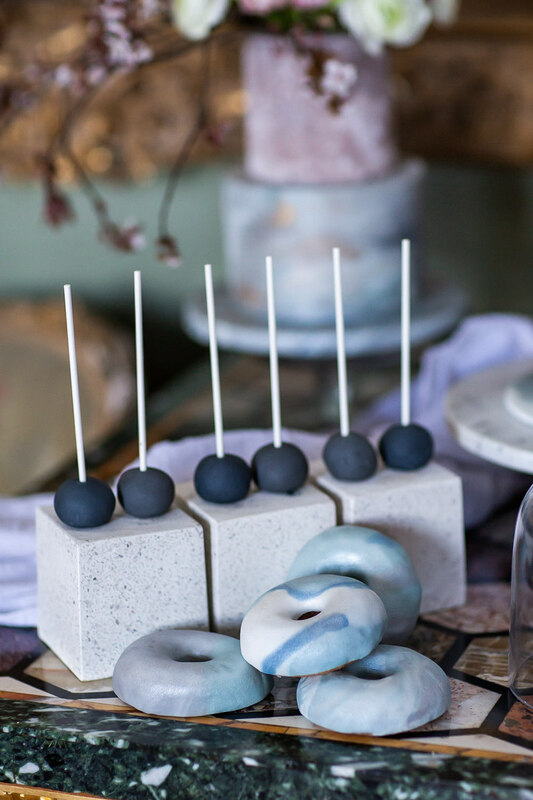 We were intrigued to play with the contrast between quiet minimalism and meaningful detail, and the complementary ways in which those concepts can manifest in décor. 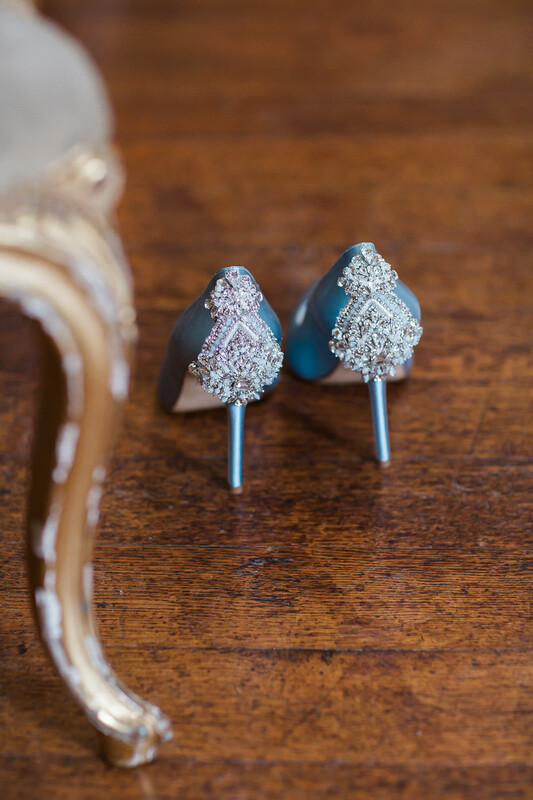 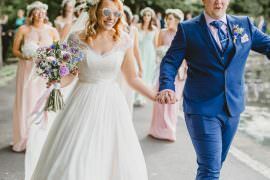 We wanted the style to be modern and romantic, with a touch of whimsy, and this was so vividly brought to life by the wonderful team of wedding industry professionals working with us on the day. 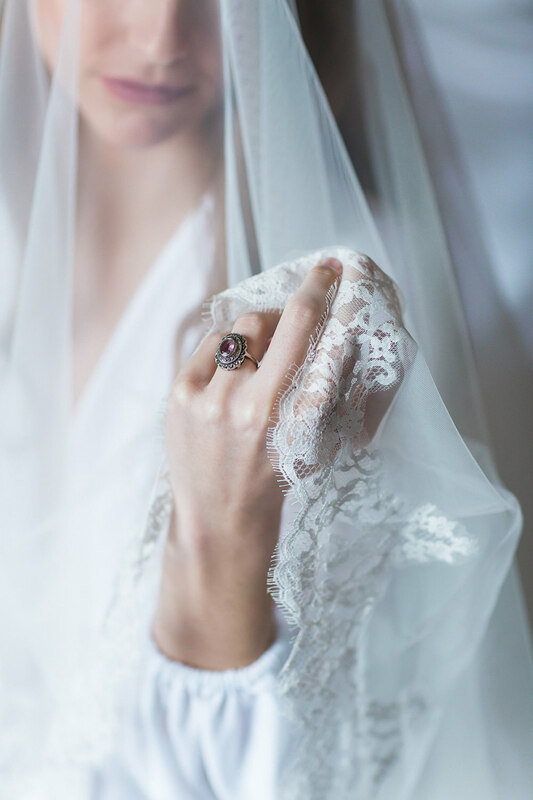 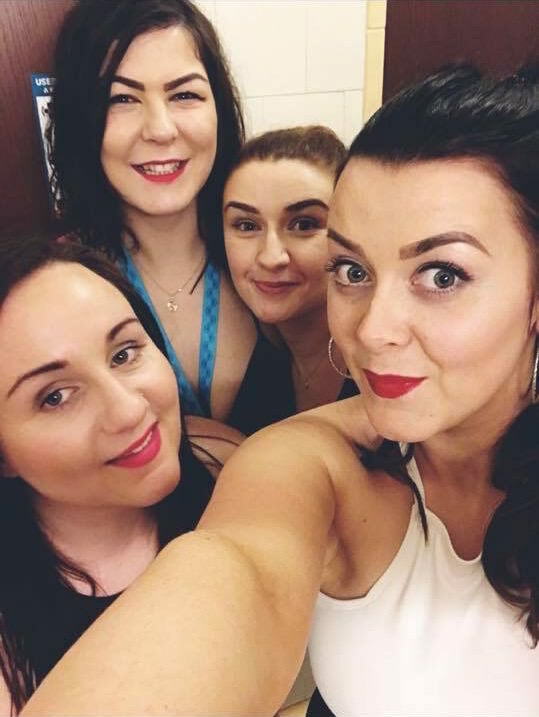 All together, the narrative is one of both trepidation and fearlessness, poise and imperfection – girl and woman, preparing for this brand new chapter of her life. 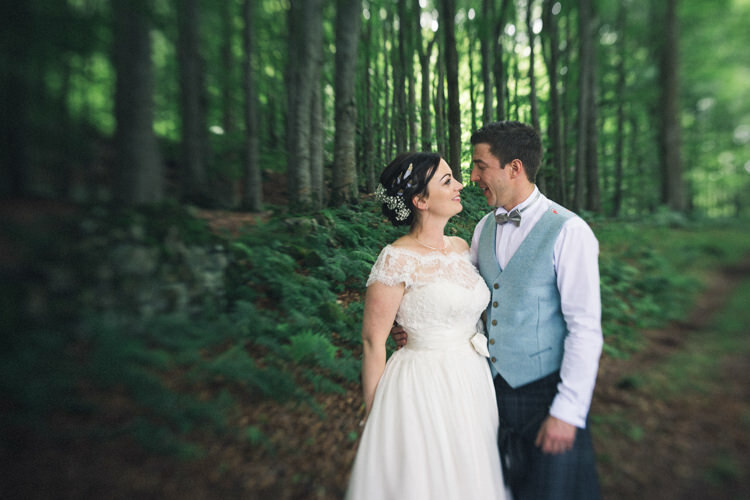 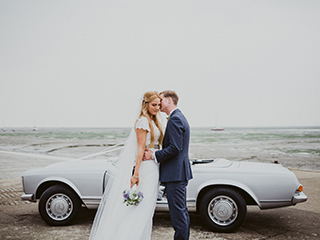 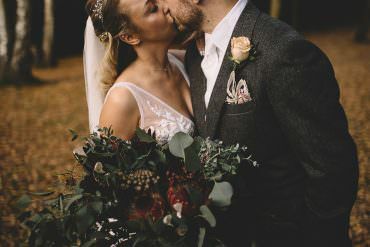 We really hope you enjoy the gallery below, and make sure you take a moment to watch the wonderful video by Yulia at Wyld Weddings! 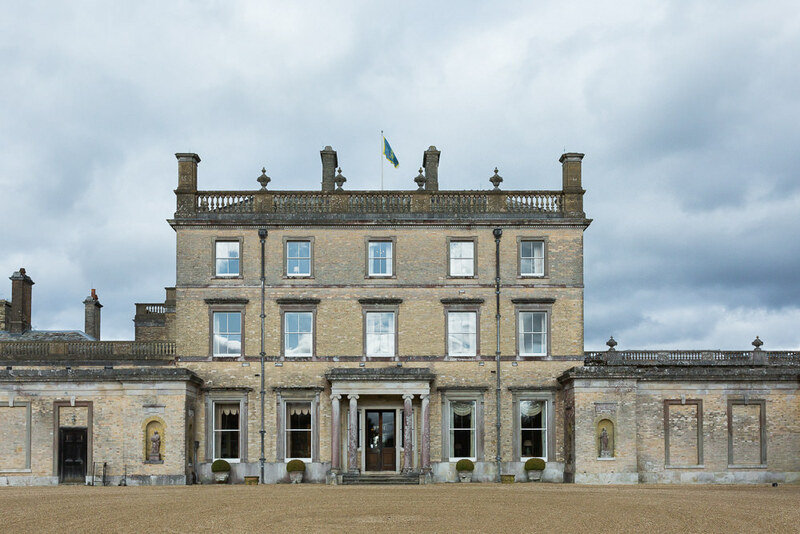 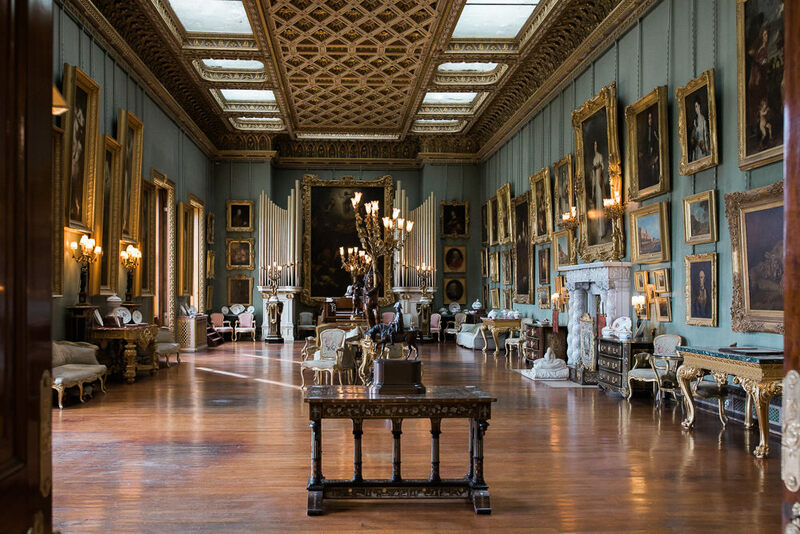 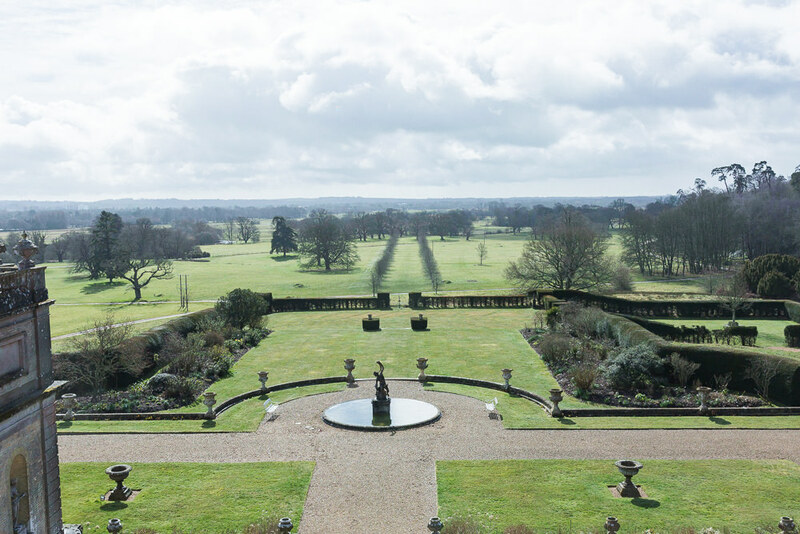 We were very privileged to shoot this story at Somerley House, a breathtaking Grade II listed stately home set on the edge of the New Forest National Park, on the Hampshire/Dorset border. 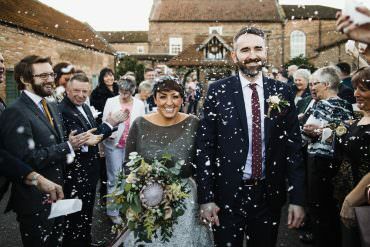 Somerley was designed by Samuel Wyatt in 1792, and has been looked after by the same family for six generations – the same family that now warmly welcome any couples looking to hire the estate for their wedding. 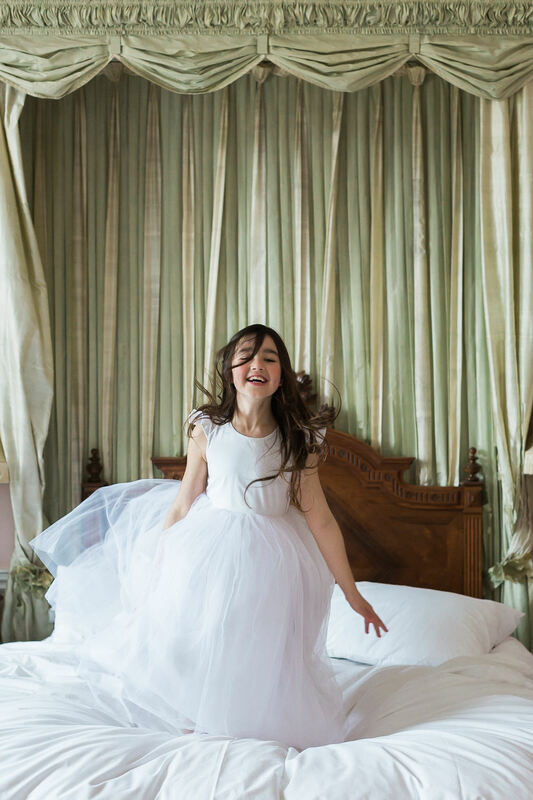 One of my favourite aspects of photographing weddings is the energy and beauty of the wedding morning; that strange heart-flipping feeling, that makes brides skip around in an excited, playful way. 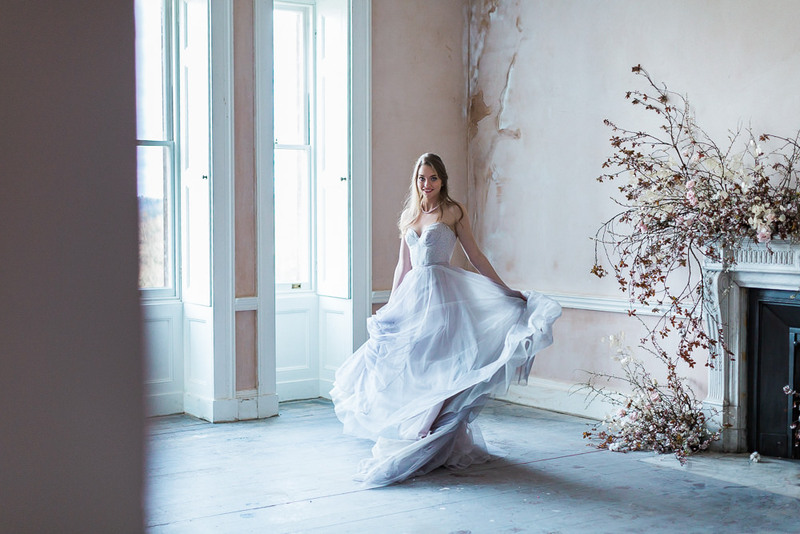 To me, that has always felt like the real ‘first dance’ of the day and I wanted to explore that emotion and this dynamic sense of movement. 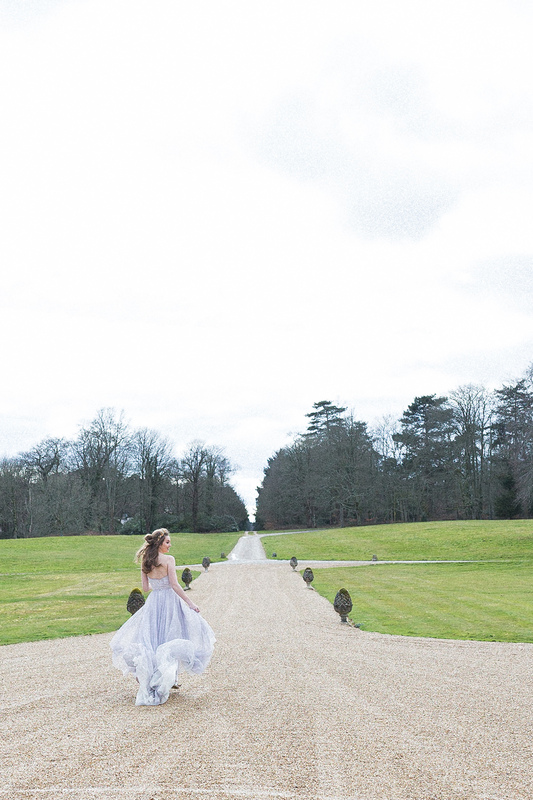 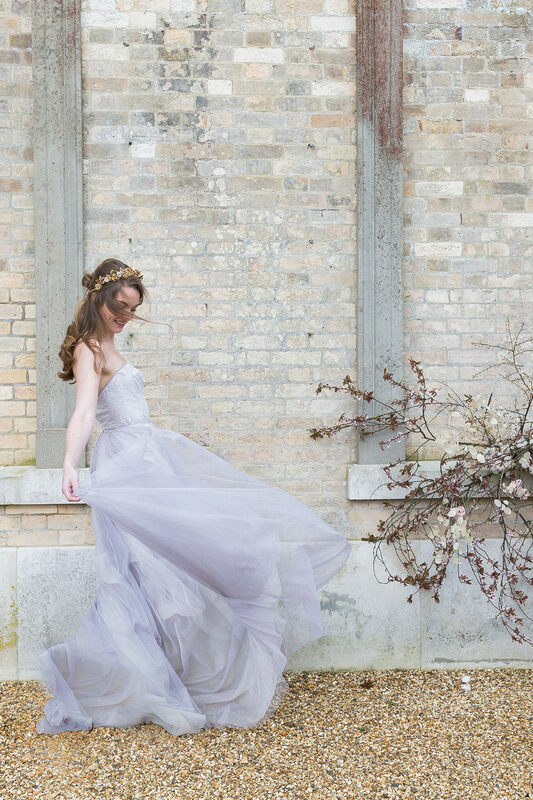 Somerley House was the perfect venue for our story, a magical place full of wonder where dreams come to life. 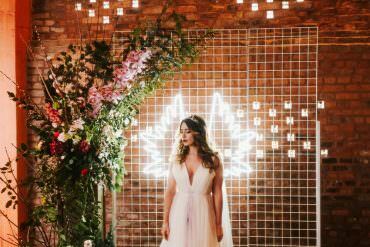 Rather than creating a full tablescape, we chose to focus on the interaction between the bride and the space, and on the emotions she lives as she prepares for her wedding: the pensive calm, the exhilarating tenseness, and the joyful bliss. 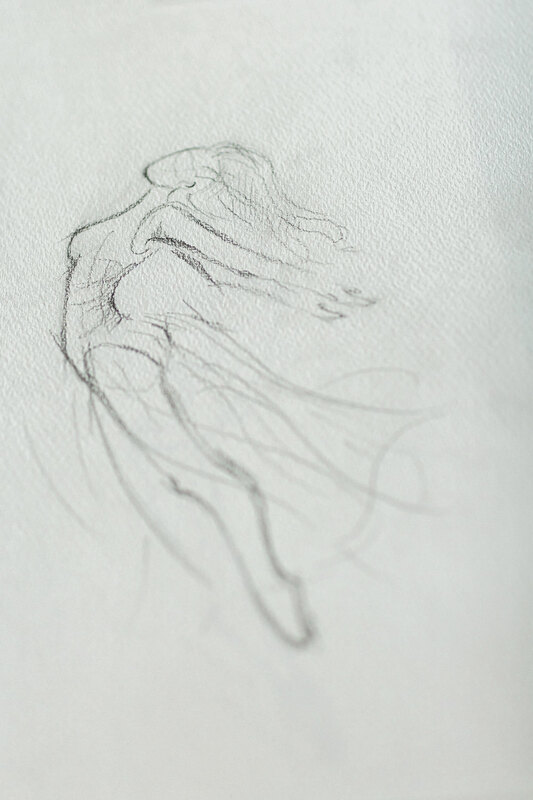 Every element was designed to echo these emotions, and the shapes and evolution of her dance. 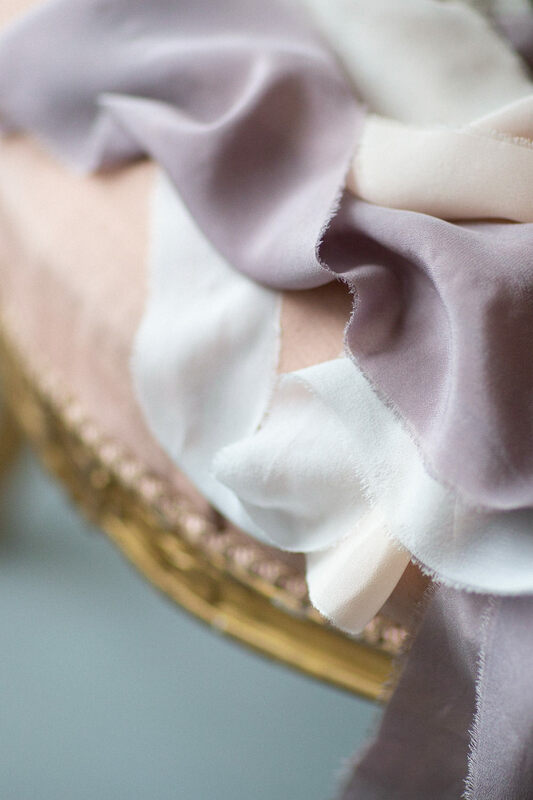 Her nightwear by Domenica Domenica and bridalwear by Naomi Neoh was romantic and yet unwaveringly fierce, with floral patterns and shimmering lilac hues complemented by the stunning lace-up shoes by Freya Rose. 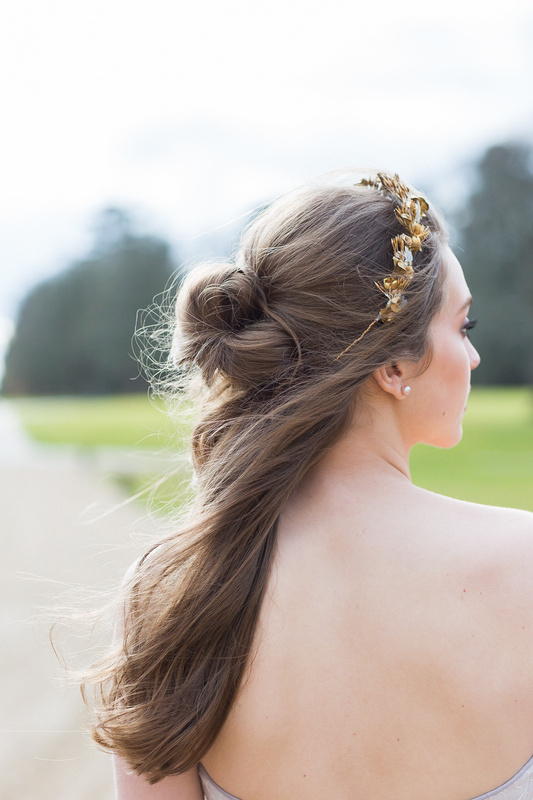 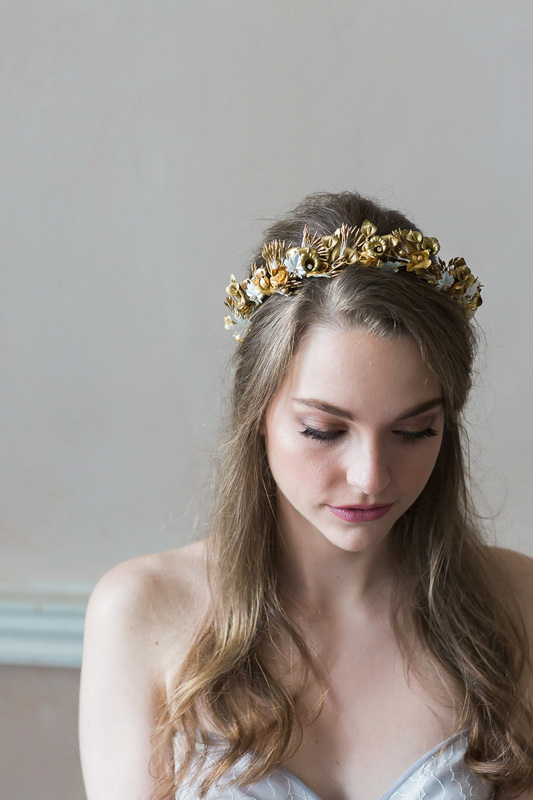 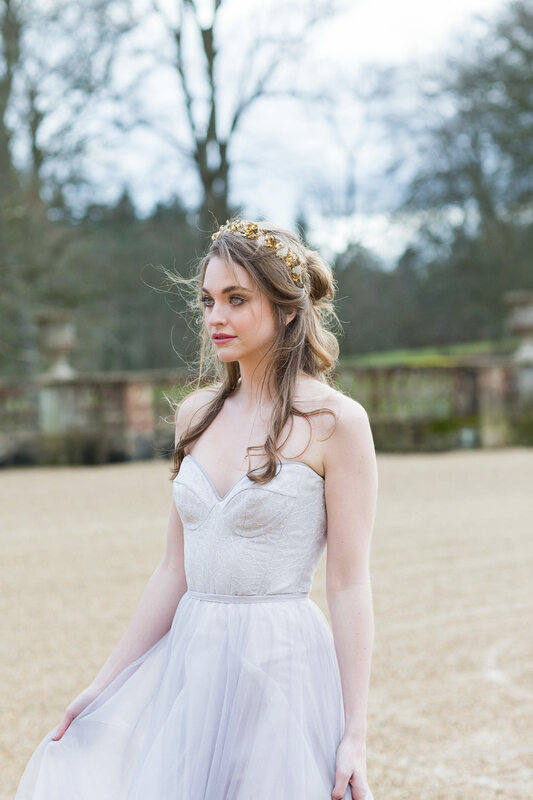 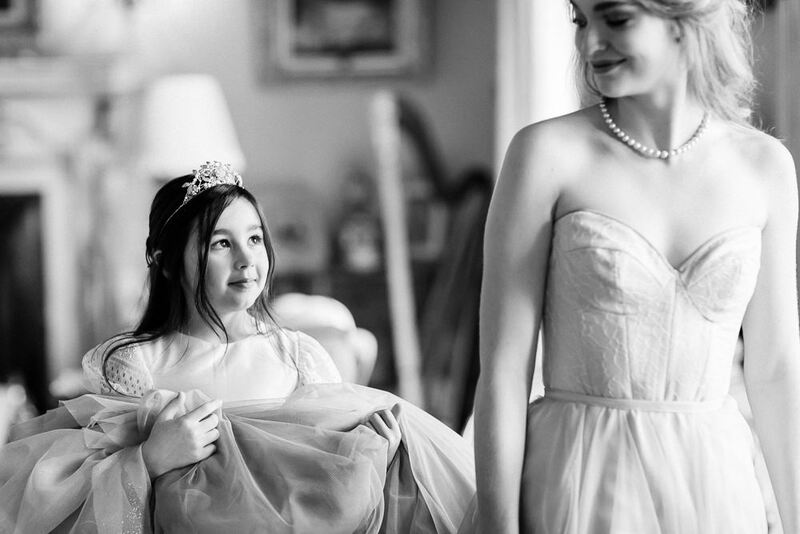 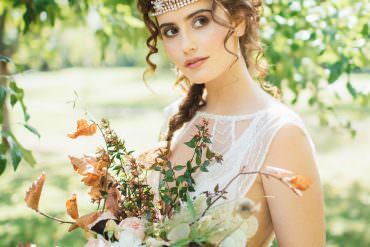 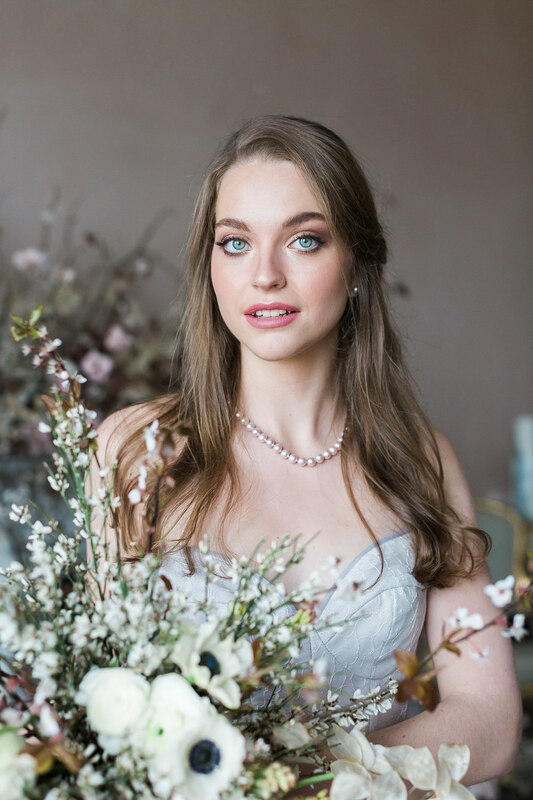 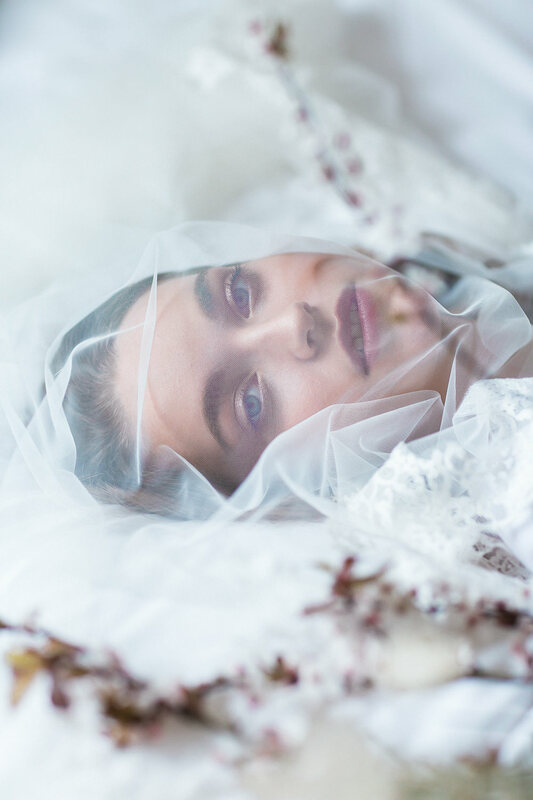 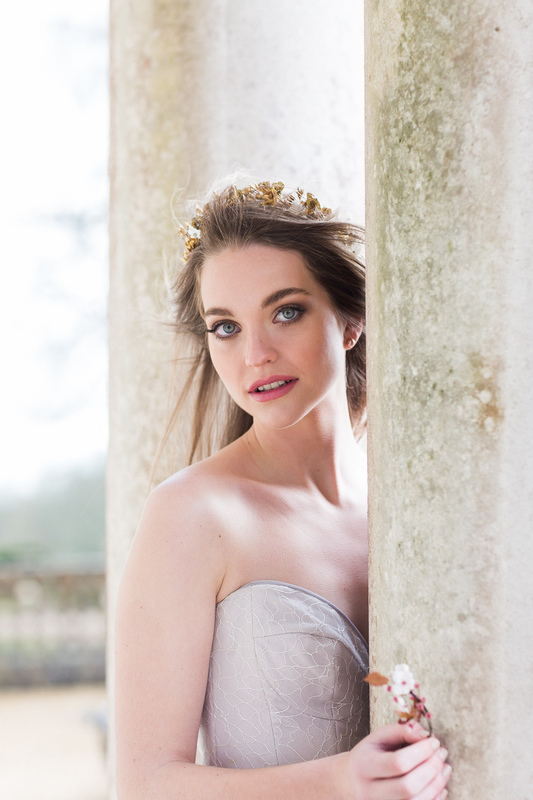 Susan Yates and Grace Bailey created two bridal looks for us, so elegant in their wildness, adorned with an exquisitely regal tiara by Samantha Walden. 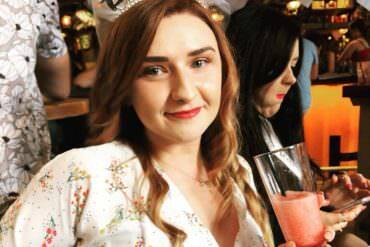 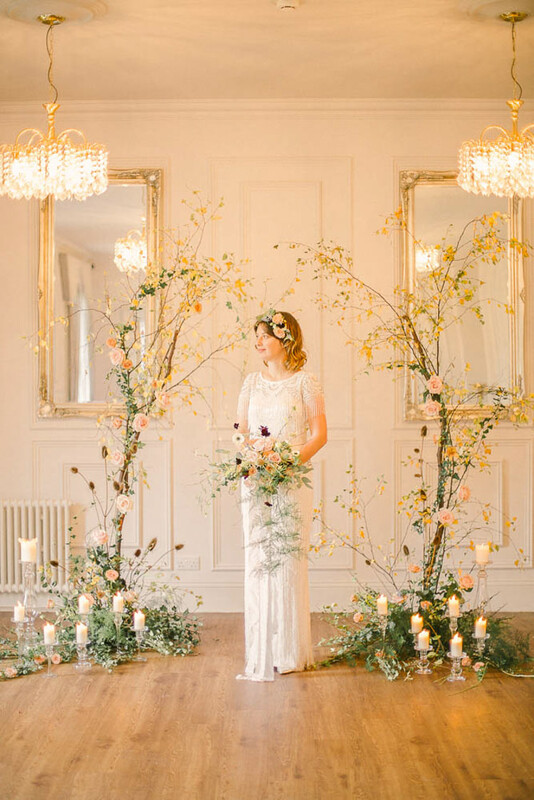 We wanted to create a really beautiful look that would almost appear effortless. 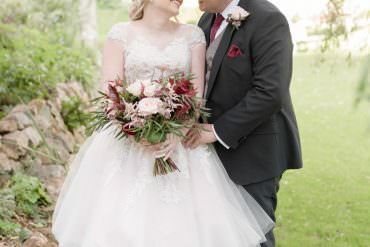 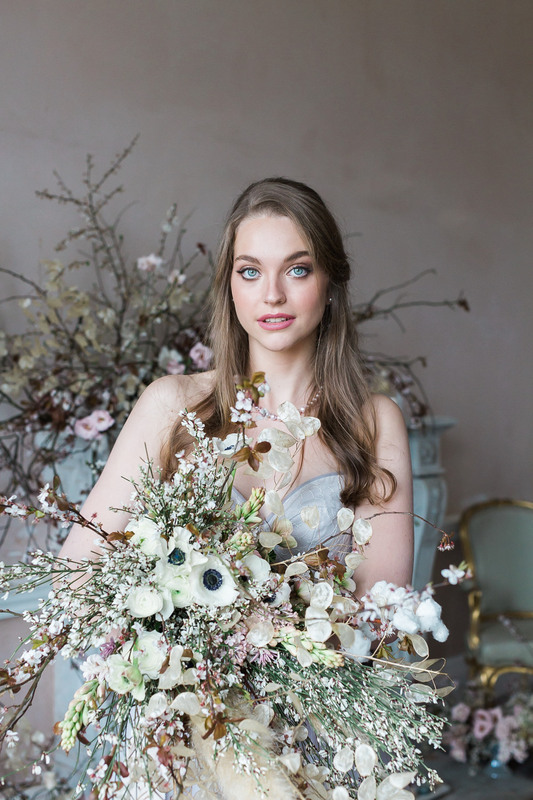 I used a very neutral rosy palette and a gentle pink lip which would complement the dress and headpieces as well as the delicate flowers and backdrop. 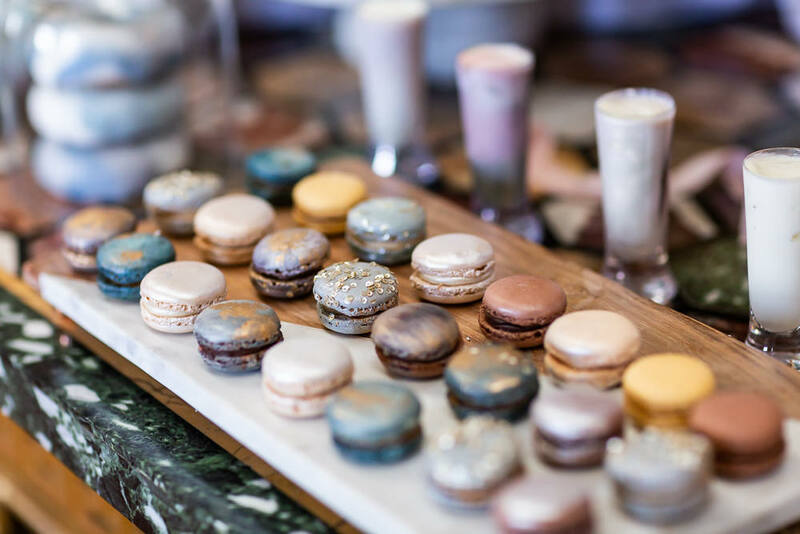 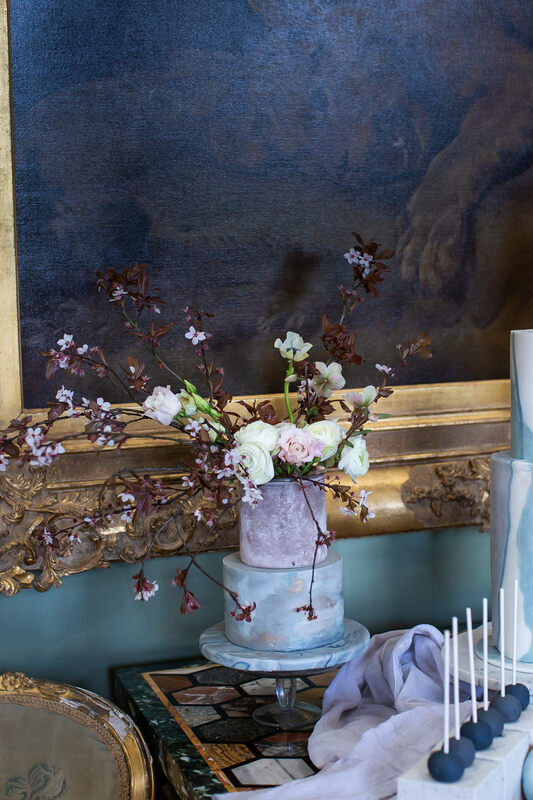 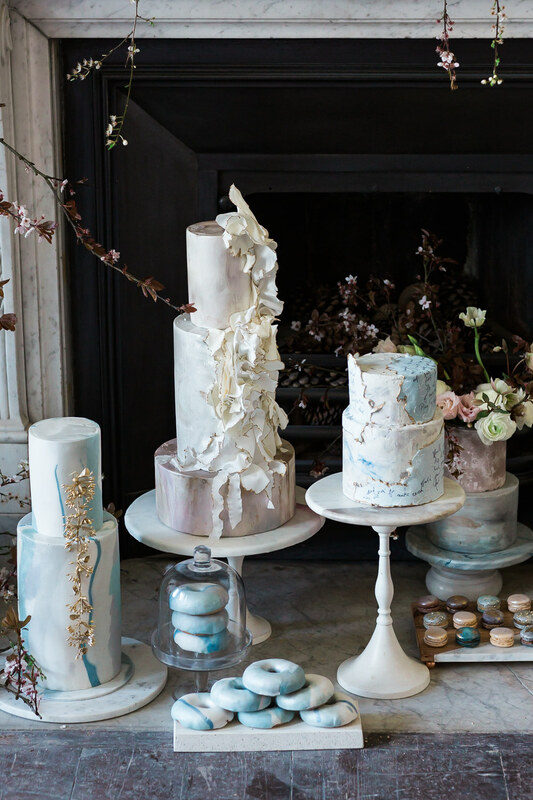 With a similar colour palette of pale greys, powder chalk blues, and ballet satin pinks, Kate Burt created a dreamy dessert table for us featuring three cakes, macarons, doughnuts, cake pops, and mini mousses. 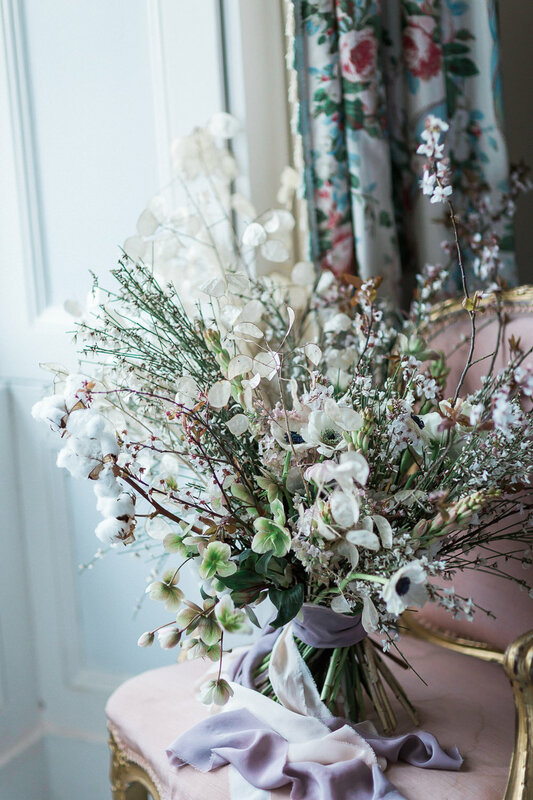 The focus for me was on textures that evoke romance and the passing of time. 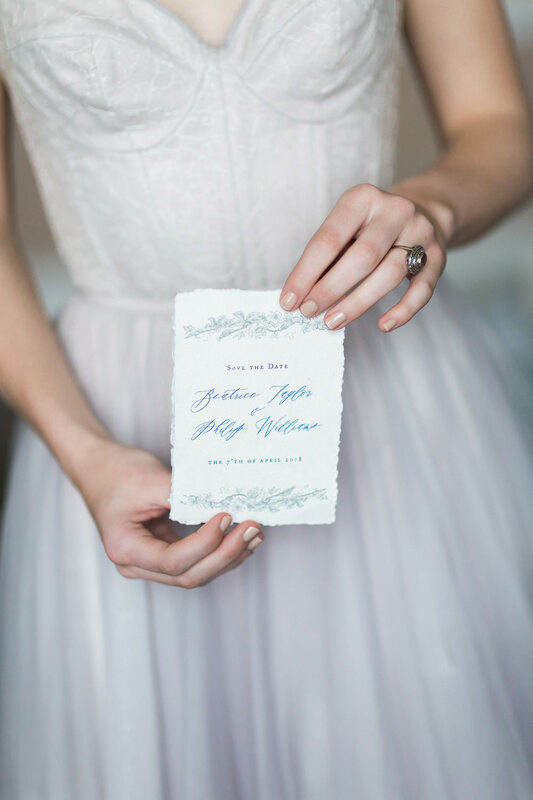 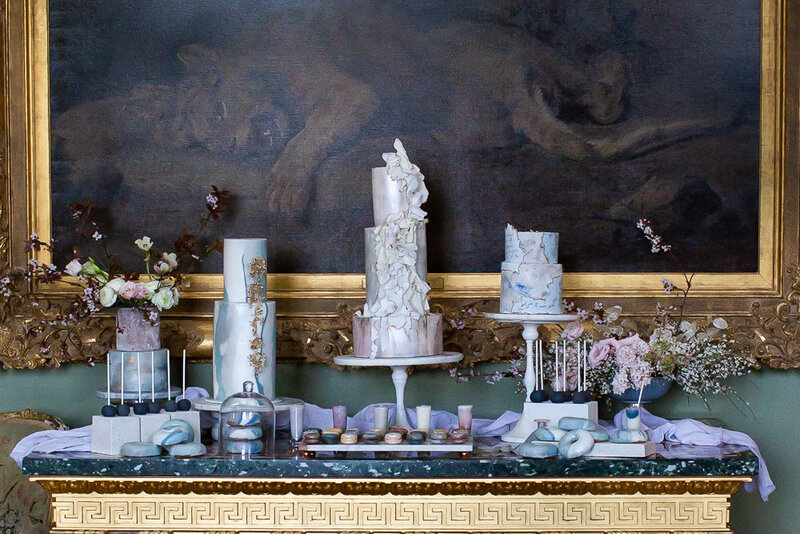 When designing the dessert table I was inspired by great loves passed and love letters, like those from Johnny Cash, Richard Burton, all the way to Victorian English prose. 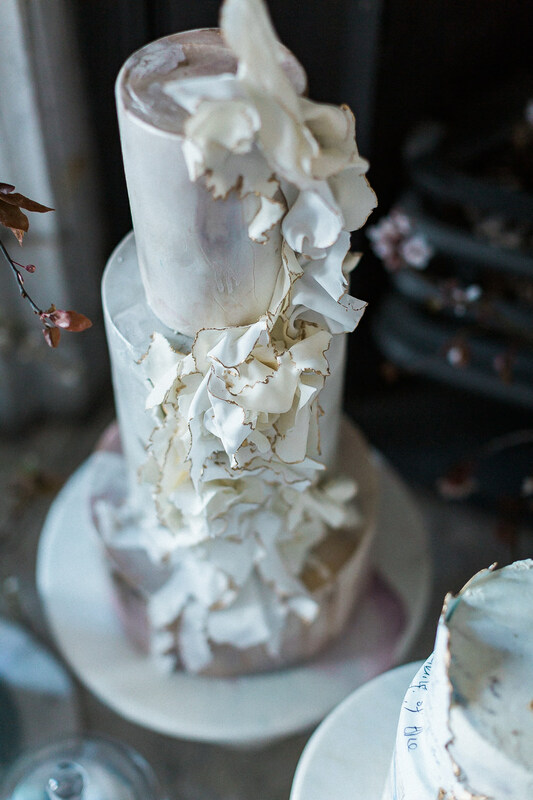 I used a palette of pale colours and subtle metallics to give a sense of intimacy and fragility. 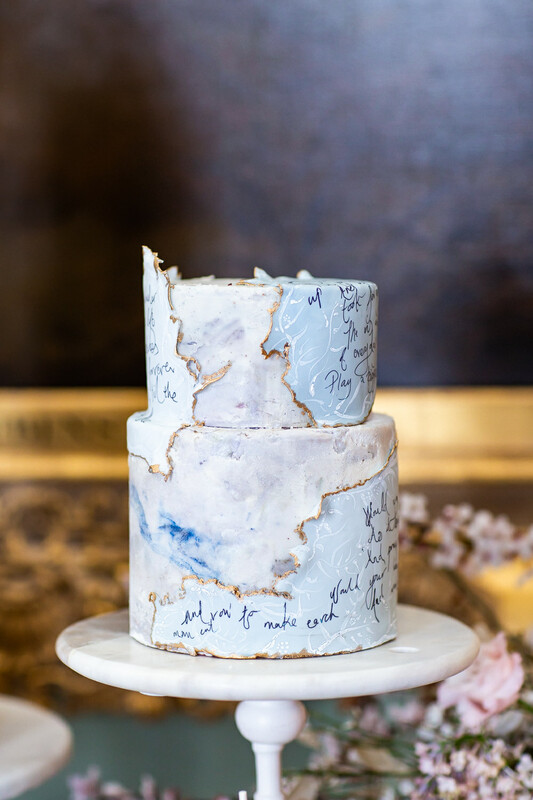 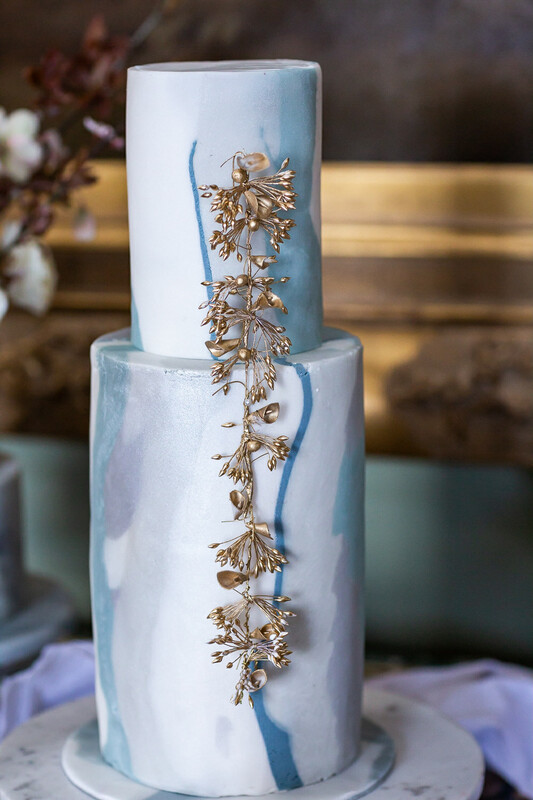 I also wanted to incorporate a strongly individual and contemporary feel, using experimental marbling and icing techniques. 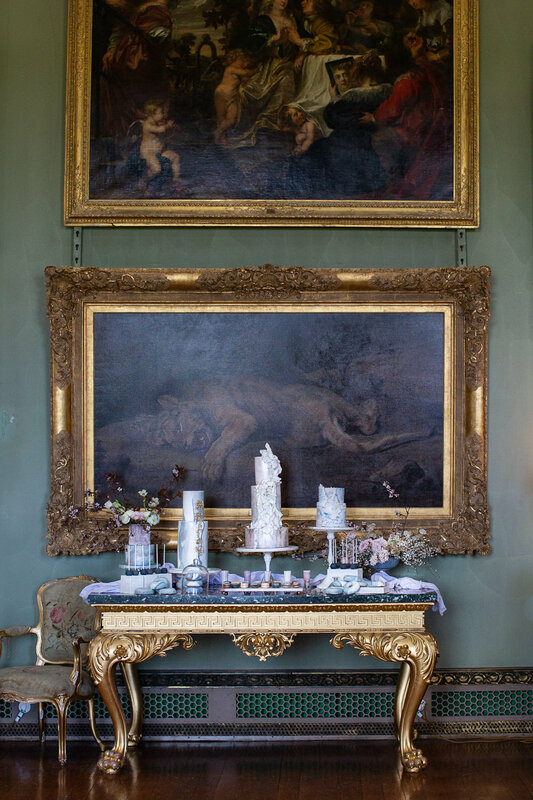 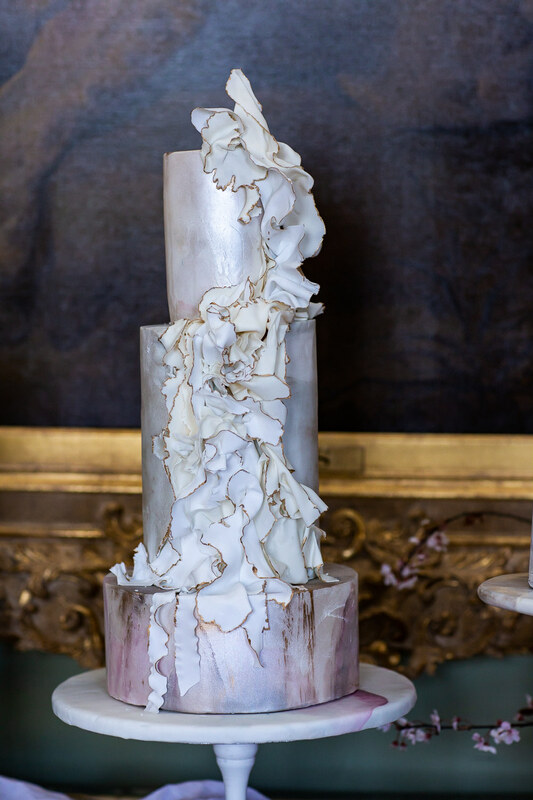 Having the rich historic grandeur of Somerley House to offset and contrast the modern design of the cake table also added to the impact of the visual narrative. 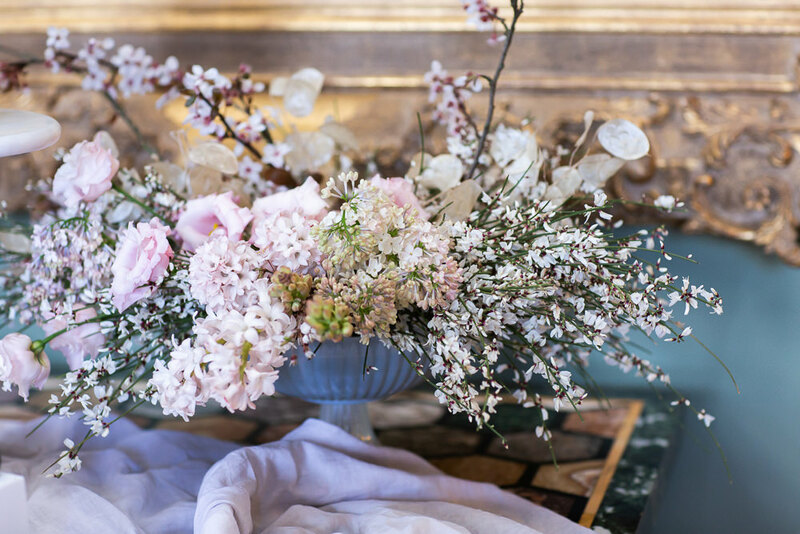 The floral design by Jenni Bloom features a striking, wild mantelpiece installation inspired by Ikebana, negative space, and asymmetry, with florals blooming in the most unexpected places. 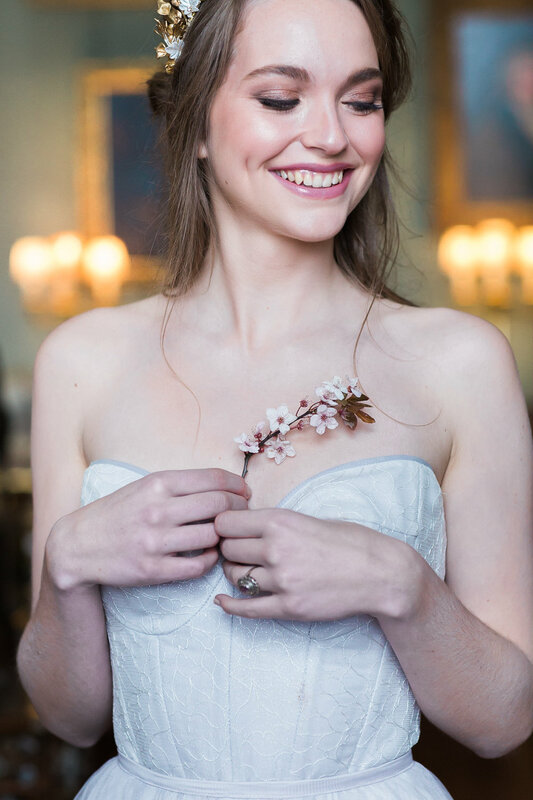 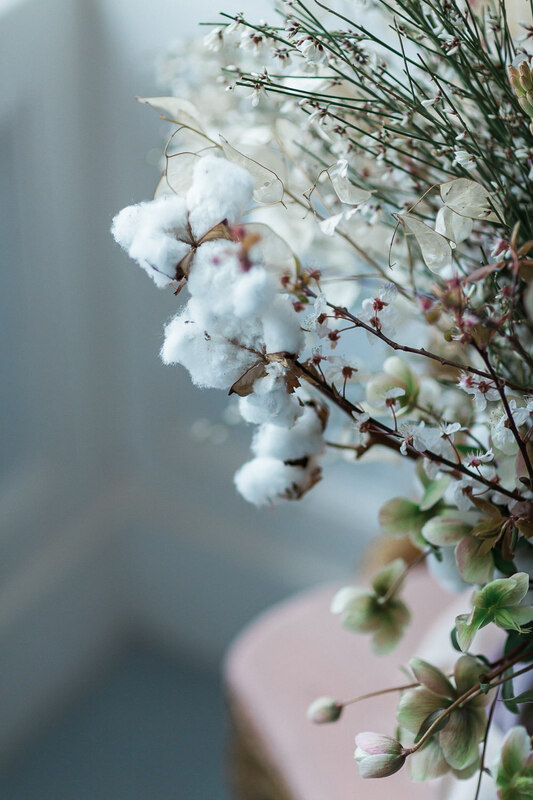 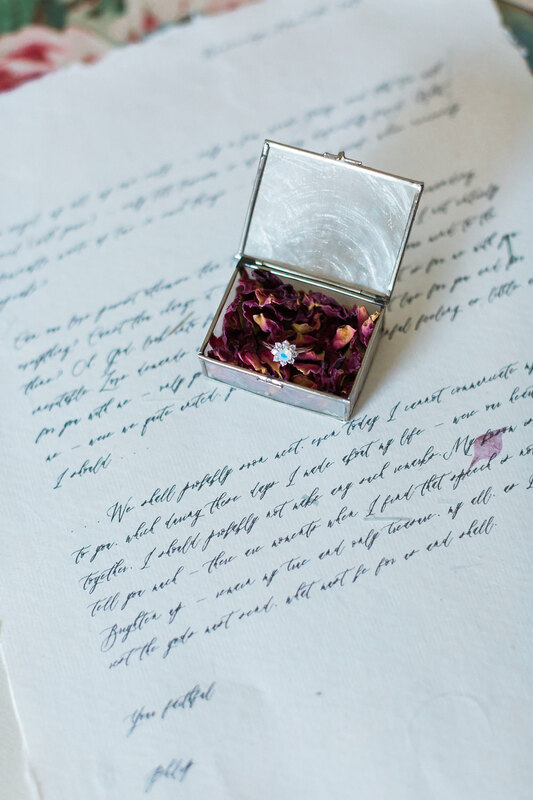 The bouquet is untameable, like our bride, with foraged cherry blossoms, cotton flowers, and lunaria, pearlescent like the amethyst and moonstone sparkling on our bride’s fingers. 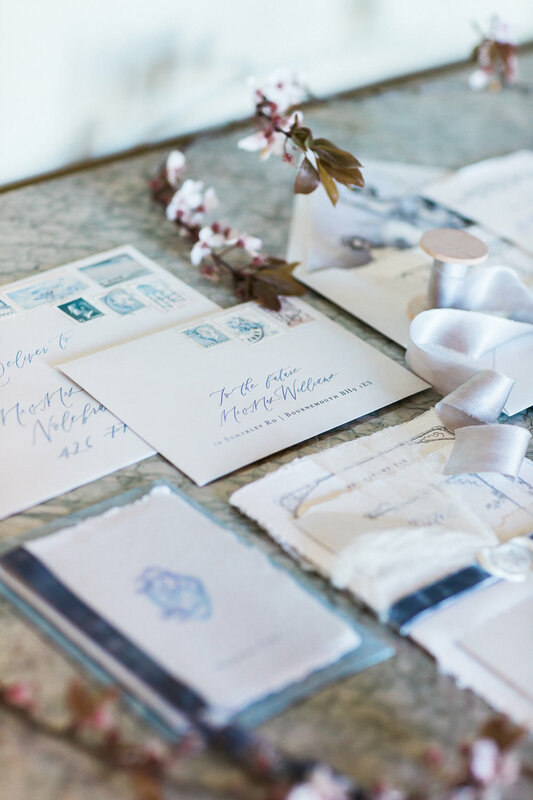 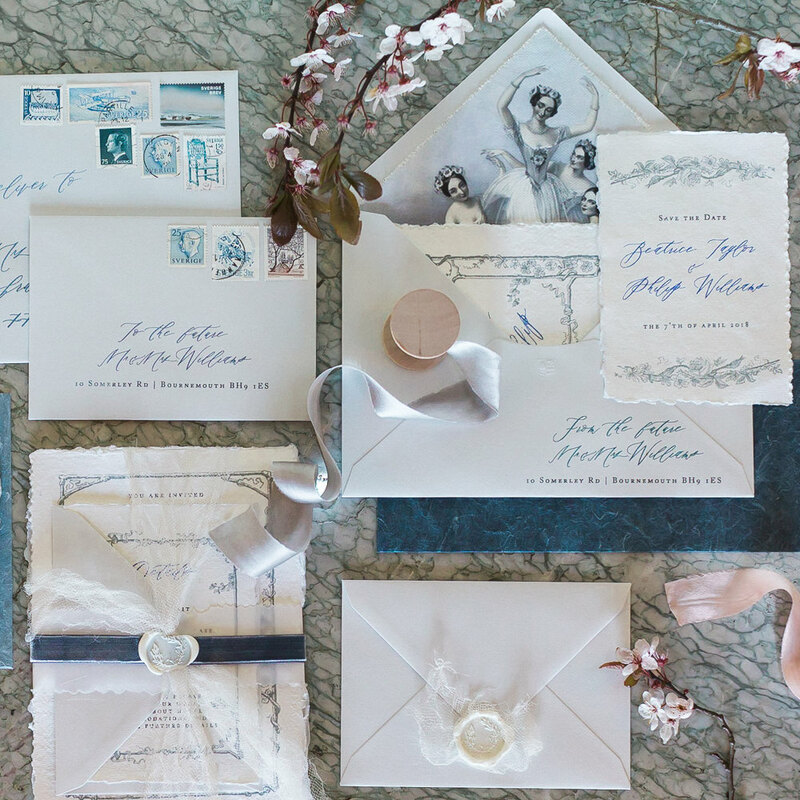 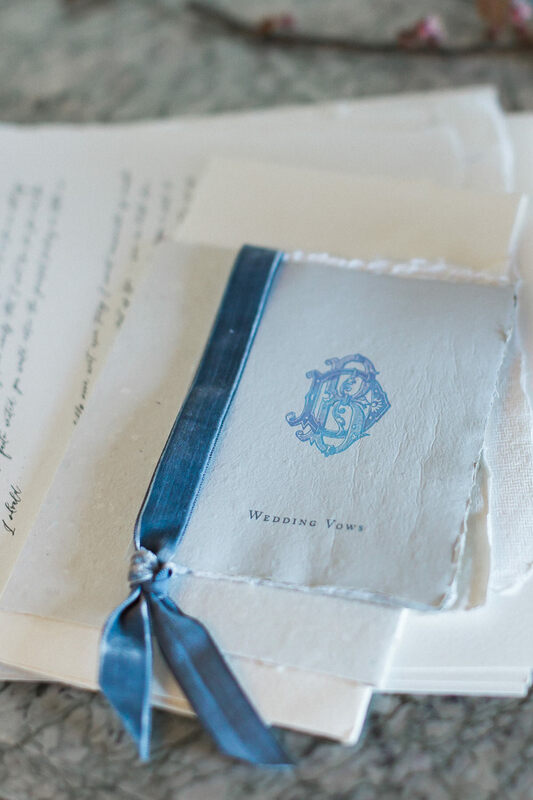 The stationery suite created for us by Elin’s Art Studio was artful and delicate, in shades of grey and blue, with deckled edges, crisp white wax, and soft velvet bands.